The UK's largest independent cheese producer and milk processor has today (2 July) officially opened a new water recovery plant which effectively closes the loop on its wastewater. Wyke Farms, which supplies all of the major UK supermarkets, has upgraded the water management facilities at its flagship factory in Bruton, Somerset, with the new system recovering up to 95% of the site's wastewater and saving the firm up to 850,000 litres of water per day. Speaking exclusively to edie.net, Wyke Farms' managing director Richard Clothier explained that the £1.3m investment in this cutting-edge technology is more sustainable approach to water extraction or using larger incoming mains, given that the company uses approximately one litre of water for every litre of milk that it processes. "This is a much more circular system," said Clothier. "The membrane filtration system, which is installed in the effluent area of the factory, has already reduced water consumption by 70%. "We're able to use about 300m3 of extra water extra per day because of this plant. It also saves the amount that we're drawing in off of mains and boreholes. At certain times of the year it can recover up to 500m3 extra every day." Clothier, a third-generation family member at Wyke Farms, also believes that this closed-loop system offers a certain amount of future-proofing for the company, which has previously dealt with water supply issues during the 2012 drought and the recent UK floods. "The business believes in climate change," he added. "The 2012 drought was one of the drivers behind this project; we wanted to be more self-sufficient. We've had the most terrible wet winter here in Somerset - if the message that the climate is getting more volatile needed driving home to people, then I think the floods were probably the most visual example of that. "All manufacturers are going to have to start viewing the way they use water completely differently. It's becoming a finite resource and the supply of it is beginning to fluctuate dramatically. Like all factories, we can't operate without water. If we can make ourselves self-sufficient then it makes the business far more robust going forward." 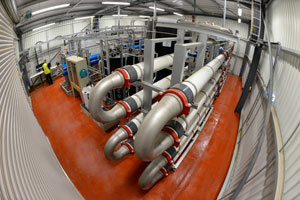 The new water recovery plant is part of Wyke Farms' £10m, long-term sustainability plan - '100% Green'. The recent launch of the firm's own on-site biogas plant as part of that plan made Wyke Farms become the UK's first national cheddar brand to be 100% self-sufficient in green energy. The second phase of the anaerobic digester project is already in progress and due to launch later this year. This will generate up to £2m of upgraded biogas per year, ensuring that Wyke Farms buys no gas from grid. Wyke has also continued to make significant reductions in its carbon footprint by fitting solar panelling across its family-owned farms and cheese dairy, using electric vehicles for delivery and reducing its packaging waste. Clothier concluded that this circular approach to sustainability has also provided a unique marketing and branding opportunity for the company, with customer data showing a growing interest in the green credentials of products. "One of my customers had a 30,000 shopper panel - 92% of those shoppers 'care' about being green and 21% 'care very much' about being green. So it's obviously something that's becoming more mainstream - particularly among the younger generation." The Parliamentary Under Secretary of State for Energy and Climate Change, Baroness Verma officially opens Wyke Farms' new water recovery plant today. The Conservative Parliamentary Candidate for Somerton and Frome, David Warburton, will also be among guests to mark the occasion.